Douglas Peacock, chairman of the North Kelvin Meadow Campaign, and Karen Chung, treasurer, appeared before a Court 1A packed with Meadow supporters at Glasgow Sheriff Court yesterday to defend an interim interdict brought against them by Glasgow City Council. The interdict was sought by the Council to try and prevent Karen, Douglas and the campaign group from cleaning up and improving the derelict land on the site of the former Clouston Street Playing Fields – now known as the North Kelvin Meadow – ahead of a proposed sale to a property developer. The court action, which has appalled local residents and been described as “absurd” by Patrick Harvie MSP, saw Glasgow City Council get the campaign group’s name wrong in the legal documentation and in court, and radically reduce the terms of the interdict they were demanding before a not-very-impressed sheriff. The result is that Douglas and Karen only are prevented from putting up bat boxes on the land and installing raised beds. Douglas and Karen can continue to tend their existing beds, and the rest of the group can continue as before. The sheriff said Douglas and Karen “had done only good”. Karen will seek to have this limited interdict overturned on appeal. 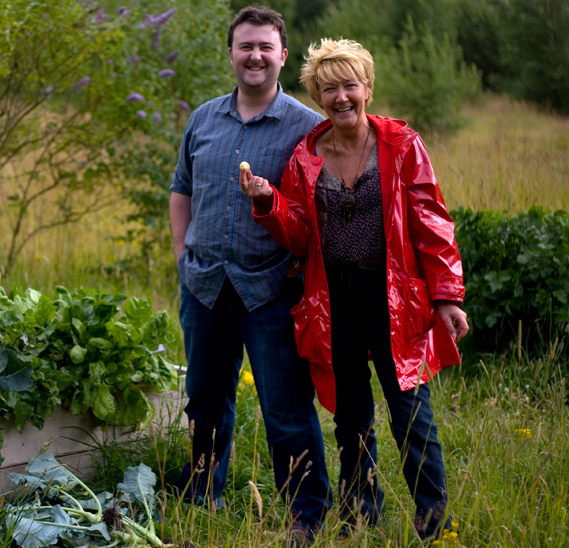 She will base her case on a motion passed by Glasgow City Council in October 2008 which encourages the public to make use of derelict land for crop production in the period before development takes place. In his closing remarks on Friday, Douglas reminded the court that this was the first time the community group had been in the same room as the Council – despite the group’s repeated requests for a meeting and attempts by Bob Doris MSP to broker this. This gives the lie to the Council’s claim to have consulted with the local community. The Council’s claim that the community had a choice about what would happen to the land and chose the residential development the Council favours is also disingenuous. At the consultation stage, the community was, in fact, presented with four broadly similar proposals, all residential in nature. It opted for the ‘least worst’. Furthermore, although the Council claims the money from the sale of the land will be used to refurbish playing facilities at the corner of Queen Margaret Drive and Maryhill Road, in fact only a fraction (less than one-tenth) will be used for this purpose. What will happen to the rest? There has been no word from the Council about this. Could it be that local people are being deprived of their green space to pay off the debts the Council has run up? Shame the BBC seem to have the wrong end of the stick as regards the judgement. Don’t recall that being discussed or even proposed by the council at yesterday’s hearing. Is there a transcript of the Sheriffs Judgment publicly available? site which you link to. Oh the Irony! The BBC have amended their report now it’s been pointed out to them the original one was inaccurate.